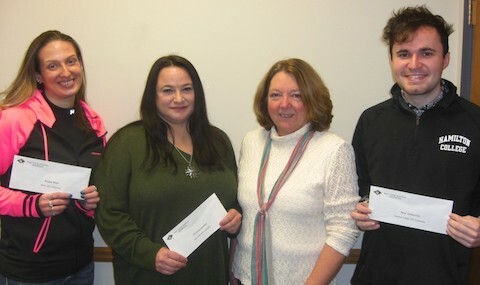 The Rome College Foundation awards $1,000 grants to Rome area college students. The program was started in 1991 and was called the Mid-Career Incentive Awards. In 2015, the name changed to the Rome College Foundation Scholarship. The awards continue to be based on academic achievement, citizenship, and need. Students at Utica College, SUNY Polytechnic Institute, Mohawk Valley Community College, and Hamilton College are eligible to apply. Applications available at financial aid offices at these colleges. The 2018 Rome College Foundation Scholarship honorees received their awards of $1,000 each. Rome College Foundation Scholarships were presented by Foundation President Sue Carvelli. At Sue's right is scholarship recipient Ryan Tamburrino, Hamilton College. At left are Randee West, Mohawk Valley Community College and Christina Carambia, SUNY Polytechnic Institute. Unable to attend was recipient Timothy White of Utica College.